Its all about dye, “Wood Whisperer Style”. My goal with this video is to grossly simplify the confusing world of dyes, while also giving you the knowledge you need to determine the working characteristics of any dye just by looking at the ingredients list or MSDS. We’ll discuss the different types of dyes, how to apply them, and we’ll even get into the chemistry behind water-based finishes and a key family of solvents known as glycol ethers. Knowledge is power! This video was pulled from the Guild Archive and was re-mastered for your viewing pleasure. If you want to see more DVD quality videos like this one, consider joining the Guild! Great video Marc. I noticed on the technical data sheet for Transtint dyes that using them with products thinned with mineral spirits is not recommended and they may be incompatible. Have you ever had an issue with it? Thanks for making another highly informative video. I’m just constantly amazed at the high quality of video you make without an entire crew behind the scenes! A TRUE half hour of exceptional quality education for free!! Thanks Vic. Really appreciate that! Nice job….I have always used a combination of pigment and dyes in our stains. I have found it’s tough to get the full effect of color using only one colorant. The cabinet industry has used the step process of laying a dye down first , followed by a pigmented wiping stain to develop the best color. With the addition of the dye stains, you can mix additional color into our water base wood stains to create hundreds of colors. It’s true you normally can’t add dye such as Trans Tint to oil based stains. My rule of thumb is anything that dissolves in a glass of warm water, you can add to a water base stain or topcoat. Cool video Marc. Loved seeing the transformation of the tabletop at the end. great video as always. question about the disposal of used finish , where should it go when your done ? I leave mine in an open container outside. Once the finish evaporates, the solids can be disposed of in the regular garbage. Oh you know what that was? The old broken extension wing from my old saw, lol. Its just a piece of black melamine material. Another point to mention is the shelf life of the products. Undiluted powders and the Transtint have a very long if not indefinite shelf life because they are binder free. Anything with a binder is going to have a shorter shelf life but as you mentioned it does eliminate the need for a barrier coat and having to mix and dilute before starting. For large projects it won’t be an issue but if only a small amount is needed it might lead to waste. I just hate having to throw away half a can of finish that goes bad–I’m frugal (cheap) that way. Thanks again for all your great videos. Awesome vid. I’m preparing to dye a guitar and one thig I can’t find details on is doing a binding(unstained striped) around the edge of the face of the guitar. everywhere I read people are having problems with the dye bleeding under any sort of tape. Anyway you could help me out before i ruin a 600$ piece of wood? Typically, guitars are stained/filled without masking bindings, and the bindings are scraped clean of stain before sealing and top-coating. I’m assuming you are talking about a faux binding and not about a true wood binding. Faux binding is tricky for the very reason you state about the dye bleeding under the tape. Though it’s not really bleeding under but being carried under by the wood itself. The best I can tell you is to try getting the area you want left natural more saturated with clear water then taping off. This can be tricky though as the surface will be wet (duh) and the tape won’t want to stick very well. It can work though as the area under the tape will be wetter and thus won’t tend to pull the dye into that area as readily. This only works with water-based dyes of course. You could try an alcohol base as they won’t wick as easily through the wood (though they still can). Best thing is to try on some scrap of your top and see what happens with that. Best is if that scrap is a full cut around from your body shape as then you will have better representation of all edge areas so the grain will be more likely to act the same as the body piece and give you a better idea of any areas that are more likely to wick the dye than others. You can try this multiple times by just sanding down the scraps and trying again, though you likely won’t get all the dye off. You can also try checking around on http://www.reranch.com/reranch/ for some tips. There were several big dye finishers on there about a year ago when I was looking into it myself. If anyone has a bulletproof answer it would be one of them. Just wanted to add this in case anyone else in to guitars finds this like I did. A good trick some use is to tape off the wood edge of the binding leaving only the binding exposed and shoot a layer of clear coat over the binding before applying any dye. This will keep it from bleeding onto the binding. Also makes any mistakes easier to scrape off since its easier to scrape the clear coat. I have to agree with you on that. I myself rarely use color. But many folks like staining their projects so I make my business to understand and teach the methods. We just had our floors stained while out of town to avoid the smell. They are red oak and were stained half Ebony and half Sedona Red. Unfortunately, even tho a test sample looked good, the floors came out with too strong of a reddish tint. Older floors that were refinished with the same formula on the second floor of our house came out with no red tint at all. Can a transtint be applied to a water-based poly to counteract some of the red? Even though it’s almost a year late but since you never received an answer i’ll give you one. Yes, you can add trans tint dye to any waterborne finish to alter the color and it wont obscure the grain of the wood because dyes are transparent. But truth be told, i’d leave the floors alone because even though many products claim the sun doesn’t affect them, i have yet to find any product where at least the red hues are not considerably mellowed after a year or so from the sunlight. I use a lot of a product called Solar-Lux NGR dye, which is supposed to not be effected by the sun, but the red hues definitely get taken down a bit after enough sun. The best way to get a warm black is to chemically stain the wood ebony with iron acetate (soak steel wool in vinegar overnight and you will have iron acetate). The iron reacts with tannic acid to form a cool black. There is natural tannic acid in red oak but you can also go over the floors with a layer of tannic acid dissolved in water to make sure you get a good, solid reaction. After that dries, warm up the color with a layer of warm-colored Minwax. It turns out beautifully. I recently finished a dining table and used a general finish stain. I failed to use sealcoat and my subsequent coat of varnish pulled out some of the color. So…after staining a more recent bar top, I applied sealcoat and was happy to find that very little of my stain was pulled out. The problem I ran into was when I sanded after my sealcoat application. I ended up exposing raw wood (reclaimed oak) on the raised parts of the top. I tried to be very careful to not sand too much. Can I apply 2 coats of sealcoat without a sanding between? I tried to follow the manufacturer instructions but alas…sigh:( Thanks for everything you do!!! Hey Scotty. To answer your question, yes you can apply two coats of sealcoat without sanding in between. The shellac will pretty much just melt into the previous layer and become one anyway. I am curious which one of GF’s stains you used? Oil-based, gel, or water-based? Thanks…great to hear that I can layer without sanding! I used the oil based GF. The color and grain pop turned out great. I’m guessing you are asking to get an idea of how deep it penetrated. I didn’t touch the surface with sandpaper, only hand planes. I’m assuming that’s why I didn’t get deeper stain penetration. Thanks again! A quick note on something that happened to me recently. I gave a client a few color samples for an entertainment unit and wiped them all on. They chose a general finish dye stain (dark brown I believe) that was two coats. So like I am accustomed to I sprayed the dye with one moderate coat. I went through with a second spot coat to even a few spots out and the overall tone was much darker. I stressed for a few days until I delivered it and they were very happy, thankfully. lesson, apply the stain the way you are going to apply it to the finished product. Marc, thanks for all the great and useful knowledge. Lots of good tips in the video, especially explaining the underlying chemistry taking place. One question i’m curious about is what you would recommend for a grain filler that would work well with General Finishes dye stain? Running through a few test finish procedures on some scrap ash & oak, just as the finish can reactivate the dye I am finding my dye step tends to pull up the water-based grain filler I had used. I would like to do the grain filling step for the smoothness of the finished surface it will afford, if I can work out a way to make it cooperate with the dye procedure. I have used Timbermate wood filler in the past with success. The material is water-based so you don’t want to be too aggressive when applying the dye over it. HVLP is a bonus here. Although the water in the dye can reactivate the filler, if you aren’t rubbing too hard you shouldn’t really pull too much up. Of course if you keep having problems, you may need to try a different type of coloring agent like an oil-based stain. This may be specialized to the worlds of marquetry, inlay, and probably intarsia. Those trying to mimic a natural scene (without abstracting the colors and calling it “sunglasses”) may find dyes (&/or pre-dried veneer) necessary to expand the color palette (otherwise no blues except some fungal infected woods, only drab green…). Since these compositions will be heterogeneous, I assume the dyes would be put on before assembly, but worry that finishing products might lift the dyes (& worse, smear the colors across pieces that were supposed to contrast) & finishing would of course follow assembly and sanding. My immediate project is to use my greenest colored “poplar” [which I believe is actually tulip poplar, Liriodendron tulipifera] veneer for leaves. However it is still a very subtle/drab olive and likely to fade/oxidize more brownish. So I was planning on perking it up with green food coloring [water soluble combo of Yellow #5, Blue #1, antifreeze as solvent, and a preservative]. The blue component of this is definitely alcohol soluble as well [yellow scarcely so according to the literature but perhaps still enough to bleed color]. I wanted to experiment with French polishing on the same project, but EtOH is the solvent for shellac. So I was thinking of using a Danish Oil, then French polishing with shellac (after a week to cure? ), since these colors are not soluble in oil, which presumably would seal them in and prevent contact with the polar alcohol. Aside from the time factor, is that reasonable? Also, is there some way to identify the colorants / solvent/topcoat -compatibilities of pre-died veneers? I was wondering the same thing. My plan was to try this filler http://www.stewmac.com/shop/Fi.....iller.html and see how it goes. I just spent 700$ on a guitar neck and body and after everything else it’s going to cost me well over 1000$ and I don’t want to screw everything up. My other question… After putting down the stain. How can I get a nice rock hard mirror finish? Being a guitar it will have to be very durable. There are a number of finishes that will give you a nice high gloss effect. Just depends which direction you want to go: oil varnish, water, laquer or shellac. Regardless which one you use, you will need to buff and polish the surface to the super high gloss you are looking for. If you use an oil-based varnish, be sure to give it a good week to cure before attempting the polishing process. As for the grain filling, would the wiping varnish as a grain filler with sandpaper work on dyed (or stained) wood? I would think it would start ripping up the dye. I wouldn’t recommend it for colored wood. I’ve been woodworking for about two and a half years and limited myself to pretty much minwax products. They are fine to work with, but I felt like I’ve been cheating myself by limiting myself to a brand at a box store. The two finishes I’ve used to date are both minwax water-based semigloss and oil-based gloss. In the time since finding your site two months ago I’ve watched you swear by ArmRSeal and bought a can of semigloss that I am using on my next project. I already have mineral spirits and oil based poly, so naturally bought a can of boiled linseed oil and plan on using a slight variety of your 1/3 rule to get more protection, as you have taught me. I found it amazingly easy to understand how things work and how to mix them (safely) for predictable results by understanding what’s in the can and how they interact. It’s strange that I’ve watched dozens of finishing videos and they mention you can make your own, but your video here is the only one that gave me the details and encouragement to try something new (to me at least). Thanks for the great video. Finishing is still a learning process for me and this was extremely helpful. I’ve gone through a lot of websites in trying to learn about woodworking and your site is definitely my favorite for giving good info and keeping things entertaining. Thanks! I’ve read that when using water based dyes you can dye all the parts before glue up and the glue will still adhere fine to the dyed wood. Is that so with the GF dye stains? I have never tried this with GF dyes. They do contain a little binder, which essentially seals the surface to at least some extent. So glue penetration might be inhibited as a result. So I probably wouldn’t take any chances until you run a few tests. Great video, very informative! I was hoping you could answer a few questions about it. First, what was the type of wood used for the first test panel with the orange/med brown mix? Also, after watching your video on applying a traditional mahogany finish to the rocker, it seems that your application method may have been different. Maybe I’m mistaken, but it didn’t look like you flooded the surface like you did with the test panel. I ask this because I’ve had some problems with over/uneven saturation on larger projects with this dye, while it worked fine on one flat test panel. I ended up having to apply two coats to even things out, ending up with a darker color than desired. Of course, this was before I saw your technique of pre-saturating the wood. Thanks in advance! The practice board was mahogany. Generally speaking, saturating the wood is something that works well on smaller pieces. If I go overboard saturating something like the rocker, it becomes difficult to get even color. So if you can, try separating the project into sections or “planes” that you can work on one at a time using the saturation method. And if the color is darker than you want, I would try spraying the surface down with a little water and then wiping with a clean cloth. You might be able to pull up some of the color. I really liked the color of that 7 to 4 mix so i picked them up today for a project with red oak. I just did a coupe of test pieces and they end up with no color at all in the really deep grooves with the grain. I tried letting it sit longer and also applying the dye twice with the same results. I’ve done a lot of test pieces for this project and when I did a liquid walnut stain or a watco dark walnut danish I didn’t have this issue but I did have an old can of gel stain laying around and it did this too. Am I doing something wrong or is it just the nature of such a porous wood? hey Jason. I have heard of this before but have never encountered it myself. My guess is the water-based dye is just having trouble penetrating the deeper grain pockets. Regular oil-based stains might simply be more effective at seeping into the deep grain. They also take longer to dry so they have the potential to absorb deeper. Gel stain is thick, so the only way to really get its color into the grain is to drive in there manually during stain application. So one thing you might consider doing is filling the pores with something like Timbermate. Dilute it a bit and use it to fill the pore of the oak. Then apply your stain/dye. The Timbermate filler will absorb the color readily and will generally mute the effect of the deep pores. You can use a darker color filler if you want to amplify the effect of the grain. Just be sure to test on scraps first. So, I dyed the guitar I mentioned a while back. Came out awesome. Pics are in this link. Thanks for the useful info Marc! After researching, it appears that I’ll be going straight Stickley on this piece. Turns out one of the big reasons mission oak finishes have a glaze coat is to fill those uncolored pores so I’m going to go with the 7 orange to 4 medium brown and then seal and do a dark glaze (maybe even black) just to fill those pores and really pop the grain then seal again then topcoat. Sounds like a plan! Let me know how it works out. very cool, picked up some transfast today for a cherry hall mirror. Loved your spray method at the end of the video but what is with the feather boa in the background? Well, that was given to me by Victoria Marks (David Marks wife) during a trip to Vegas. I think she got it from a show they attended. I couldn’t resist making it a permanent part of my shop decor! I live in the Chicago suburbs. Can you stain with water based dye stains and top coat in temperature below 32F? My garage is not heated. Hey Nasar. Keep in mind that water freezes at 32F. So applying it at those temps might be a little like rubbing an ice cube on your projects. If you take some warm water-based dye and apply it to a project, it will most likely be fine since its just evaporation. Hopefully the water will absorb and evaporate before it freezes. But for the finish, I probably wouldn’t recommend it in temperatures that low. Thanks for your prompt reply. The dye itself will be kept in a warm place and I may be able to raise the temp of the garage to 40F using some portable heater. Will that work? Also, to get a rich mahogany finish, would sever coats of General finishes Dye would suffice or do I need to follow the dye with Gel Stain? Your demo was on plywood, would it be any different on solid white oak? BTW, like others, I find your videos the best. Thanks a lot. At the very end of the video, you sprayed and then wiped! I was planning to just spray and not wipe. Please comment. Either method is valid. If you are getting good even coverage without wiping, then you are good to go. Well first thing to do is read the manufacturer’s label. That will give you some general temperature guidelines. At 40F, you will certainly have a slow-curing finish. My best recommendation is to finish a scrap piece and see how it behaves. And you can certainly get a deep rich mahogany finish using dyes. No need for a gel stain. But of course you certainly COULD use a gel stain. Its all about playing with the different dye colors and seeing how it looks on the wood. Thanks much. the dye stain worked great using the Earlex spray and didn’t need to use and Pigment or Gel stain over it. I noticed that you used Earlex to spray the top coat. I used the GE new Endura-var but was unable to use the spray gun even with the 2.0 needle. Do we need to dilute this with water or use a bigger needle like 2.5. I had to brush the top coat and was NOT fun ! Hey Nasar. I have always used the 1.5mm needle/cap to spray EnduroVar without trouble. I don’t really think you need to go any bigger than that. You can certainly dilute a little, just don’t exceed 10%. I tried again. I tried both 1.5 and 2.0 and even added water but it won’t spray. As a matter of fact even the pigment stain from GF won’t spray. I succeeded only in spraying the water based dye stain. I am using the medium mesh cones you get at Home shops to filter. Any input is appreciated. That definitely doesn’t sound right Nasar. I can shoot just about anything through a 2.0 needle, except maybe viscous latex. I might contact the manufacturer. Thanks for the prompt reply. I just sent Earlex an e-mail. I am thinking that it is either defective needles or I have to use finer mesh. I made a mistake in installation. The small white washer was inserted from the front half instead of the rear half. I changed the position and now it works. My bad ! The parts can be any unit of measurement you want based on the total amount you need. Essentially these numbers are just ratios. So take the total quantity you need for the project and do the math to figure out how much of each component you would need for a 7:4 ratio. As an example, for a fairly small total amount of dye, you might mix 7 tablespoons and 4 tablespoons. Sometimes I just use a small dixie cup as my “part” and use that for measurement. Anything that allows you to scoop up a consistent amount of dye can be used to measure out your “parts”. Can I use General Finishes premixed dye, and then apply the General Finishes Semi-Gloss Arm-R-Seal? Or would that lift the dye? You should be able to do that. The General Finishes pre-mixed stuff has binder in it. So you won’t pull much color up at all with a subsequent topcoat. I’m working on a project (using pecan/hickory) and, using water solvent dye, I notice on a test piece the pores in the wood (as expected) accept little or no wood dye. Should I fill the pores and then stain, or stain, seal and then fill? In either case what type of filler would be best for getting a good top-cote (I’ll be using Hydro Coat) on the wood? I’d probably fill the pores using something like Timbermate. It accepts stain nicely so it is easy to blend during staining. Should that (or similar) product be applied prior to the initial, before application of the wood dye solution, or after the latter? i would apply it before so you can get the full benefit of staining. I have played around with dye for some time, but really haven’t researched in depth its Do’s and Don’t s and capabilities. I really like the natural look of wood and typically don’t stain, but “What the Customer wants, the Customer gets”. I am building a cherry cabinet and as you know cherry, even though very beautiful and nice to work with, can be a real bugger to finish to a nice uniform color, unless you do one of two things; no stain and don’t fret the color differences (which I love),or stain to a deep dark color that you can’t tell if it’s cherry or poplar, at least I have trouble, so why use cherry. This stuff works miracles and works very well with water based stains and dyes. In many cases, it will completely eliminate blotching and allow you to get the wood any color you want. Assuming Mahogany applied with General Finishes Dye Stain followed by Seal Coat; does the Seal Coat need to be sanded prior to applying an Arm-R-Seal Wiping Varnish topcoat? Or can the Arm-R-Seal go right on after the Seal Coat has dried? No sanding needed, or recommended. After one coat of shellac, the dye is still very close to the surface and sanding can very easily burn through that layer. So I try not to sand a stained/dyed surface until there are at least two coats of a film finish on top. Fortunately, sanding isn’t necessary so you can go right to your Arm-R-Seal. After the first coat, you can probably get away with a light 320 sanding just to smooth the surface. Hey Marc, glad this video was brought back from the archive. Quick question on using dye stains. I’ve transformed an old honey oak vanity into a nice rich walnut/mahogany color using General Finishes gel stains with great results. The gel stain went over the existing finish, so I didn’t have to strip it down. But that little project was a test piece for a very large kitchen cabinet refinish project. I found that the time it took to do the vanity would be prohibitive in doing a large kitchen, mainly because my wife would never allow me to have the kitchen torn apart for that long. So my next thought was checking into using a dye stain and HVLP sprayer. Again, the cabinets would not be stripped, so the color would be layered over the existing finish (probably 3-4 coats) until the desired color is reached. I’m trying to hide a little of the oak grain contrast as well as darken the cabinet color. I’m wondering if a product like TransTint combined with General Finishes EF PolyAcrylic top coat (i.e. mixed together and sprayed) would accomplish what I’m shooting for? Hey Ryan. In theory, yes. But you have to be real careful whenever applying finish/color over a pre-existing finish. Some finishes don’t bind well to one another and the final result just may not be as durable as you want, especially for a kitchen. I think if I were determined to go that route you describe, I might start by sanding the cabinets very lightly to scuff the surface and then thoroughly wipe down with denatured alcohol. Then I’d follow up with a light coat of dewaxed shellac to help seal off any potential impurities. At that point I would start applying the toner and then add a few extra coats for protection. If you can, try this out on the back of a door or some other inconspicuous spot just to see how well it works. i have a few questions about dyes what if you want to make a oil stain using pigments, what are the binders i have to use?? and what about using wood conditioner does that help with water base stains and dyes?? Most oil stains contain boiled linseed oil and that effectively acts as a binder. And conditioner does help when it comes to dyes and stains if you’re dealing with a blotch prone wood. But I prefer to use Charles Neil’s blotch control formular for blotch control. do you approach end grain the same as you would with an oil based stain? Hey, very informative videos, thank you. I’m an inexperienced finisher, doing a DIY project. I’m refinishing my bass guitar. The previous owner refinished it himself and he did a horrible job. The lacquer was sticky and cracked and rippled. So I have since stripped the lacquer completely off, and done some sanding. I realized after I stripped it that he stained the wood as well. The wood is basswood so it’s a naturally light wood, and he stained it almost a brick reddish color. I’ve managed to get a lot of the stain out in certain spots, but in other areas that are hard to get to the stain is still fairly thick and I can’t get sandpaper in there to sand as good as I do the flat surfaces. I attempted to use a super concentrated Calcium Hypochlorite mixture to bleach the stain, and it lightened it a little bit, but not as much as I need. I’m wanting to dye the wood a tobacco burst color (Yellow base, brown around the yellow, and black on the edge, and then blended together for the burst effect). If I don’t get all the stain out, is it going to counteract the dye? I’m mainly worried about the areas where I’ll be doing the black dye since that’s where the stain is still heavy. And in the areas that are going to be yellow, how badly will the stain show through if theres some stain left behind? I guess overall, how does dye react to stained wood? Most likely, the stain won’t interfere with the the dye. If the surface soaks up liquid, it will accept. But I think you are right to be concerned about how much the stain will show through. Dyes let everything on the surface shine through so any imperfections will be visible after the dye application. You really do need a clean slate to get good results. So I would say keep sanding or possibly use a scraper to try to get all of that stain up. I’ve ordered some Transfast water Soluble dye. Would you suggest using a wood conditioner before applying dye? Would it help the wood soak up the dye evenly? Also, you talk a bit about being careful with topcoats and the water soluble dyes. I was planning to use Deft Nitrocellulose(rattle can) as my finishing top coat, would that be alright to use over the Transfast dye? If the wood is likely to blotch, then using some sort of conditioner before the dye is not a bad idea. I recommend Charles Neil’s conditioner. Best stuff out there. And you should have no issues coating the transtint dye with spray lacquer. I’m refinishing my oak staircase banister and want a really dark espresso color. I used a smaller removable piece as a tester and found out that the wood didn’t hold the stain well. I sanded well, wiped down with mineral spirits to remove anything left, later pre conditioned the wood, and stained. What I would like to do now is dye the wood and stain. I guess my question is, is there any order in which I should dye and stain, ie dye first. Also, I’m using an oil based stain, should I only use an oil based dye? Oil-based stains contain linseed oil. once the oil cures, it will at least to some extent seal the surface. So following up with a dye probably isn’t a great idea. And instead of trying to find some sort of oil-soluble dye solution, I think it’s best to dye first. Raise the grain with some water and knock it down with some 220 grit. Then apply a water-based stain directly to the surface. Once that dries, try your oil-based stain. Again, practice on that small piece to confirm that this works better than your previous attempt before doing this on the full banister. Great video! I am currently refinishing my drum set. I wrapped my drums with a mahogany veneer, and then applied TransTint wood dye with de-natured alcohol base. I got my colors where I wanted them and even put in a ‘burst’ type on tinting. I was informed once I got the colour where I want it I could shellac over the top of it. Things were going great! I was really excited to seal my finish, and once I started applying the shellac with a brush it started to dillute my dry dye. I only did one little section and had to call it quits. What can I seal the wood with so I can put a clear coat over the top of it? You can probably get away with shellac, but it’s the application method that makes the real diference. Spraying via HVLP would be idea. Anything that makes contact with the surface is likely to affect the dye. But with HVLP, you can spray a very light coat at a time until the shellac fully seals in the dye. That’s the way I would go for something like that. Thanks very much for your advice Marc. We are attempting to achieve a dark chocolate brown finish on oak cabinets while hiding some of the grain to give it more of a solid look. We believe the best way to do this is with a dye. Do you stain first or dye? Any suggestions? Hi Amanda. Dyes generally won’t obscure the grain. I think what you are looking for is something more like a gel stain. So I would try something like General Finishes Java stain and see where that gets you. You might want to use dye first to help increase the depth of color, but dye alone probably won’t do exactly what you’re looking for. Your video here is just a life-saver. Thank you for being so clear an thorough – there is a real lack of info. about water-based stains and brand recommendations out there on the internet. He said to dye stain first, then layer the wood stain over that. Do you agree with this? And if so, what is your recommendation for how to apply a second coat of color (how long to wait, etc.)? That sounds like a decent plan to me Jill. If the dye alone gets you where you need to be, color wise, then you might not even have to worry about putting on a stain. Test on scrap to make sure you know what’s going to happen. The good thing about water-based formulas is that you can re-coat as soon as the surface is dry. How do you know it’s dry? Well, it’s just water so touch the surface and if it feels clammy, it’s not dry yet. Probably should only take a couple of hours at the most. Have cat urine stain on a teak table.Have removed urine[I think}.Is dye the best thing to use to match existing color?If so,which one? Matching just one section that was spot treated is going to be difficult if not impossible, especially if you don’t have a lot of color-matching experience. I can’t really make a solid recommendation without seeing the piece myself but you might head to a local woodworking store like Rockler or Woodcraft to see if they can recommend either a dye or stain that will get you close. Bring some pictures with you if you can. If it were my table, I would try to sand and refinish the affected section completely and then try to match it to the rest of the piece. Might help with the urine issue too should any odor remain. Thank you so much for this. I am new to wood working and I have this vid bookmarked! Once I dye wood, what can I use to give it a nice glossy finish, without effecting the coloring from the dye? Depends on what dye you used and what your using for a protective finish. Some things will have no effect but others will reactivate the dye and pull up the color. And sometimes, the way you apply the finish makes all the difference. Wiping tends to pull color up more than something like HVLP spray, for obvious reasons. Well stain is more or less a generic term for a coloring agent that may contain pigments, dyes, or a mixture of both. In your case, just about anything will work. But you need to be careful with burl because it tends to get REALLY dark when stained. Might take a bit of experimentation to find the right color that doesn’t darken it too much. But an off the shelf stain should work and dyes will work too. Just depends on what you have access to and what you’re comfortable applying. I have a few questions on dye and staining maple. I have built a table from maple flooring and my wife wants to go dark on the color, so after looking around it looked like dye may be a good option. I didn’t want to cover up all of the grain in the wood so I didn’t anything that would hide that so I bought some dark walnut transtint and made a sample board out of the spare flooring and did a couple different steps to see what would work best. First i used some SealCoat at full strength, then with it cut by half, then one square with nothing. I was really surprised how much the SealCoat prevented the dye from adding color. Now the square without shellac was a good color but it got really blotchy, and that is where I need a little guidance. What can I do to get that dark color, but prevent more of the blotching? Thanks for your help and I just stumbled across that post after I asked the question. Thanks again for all of your tips and tricks from this site and being the one to test many of the issues that many of the not so experienced woodworkers run into. Great information on the dyes Marc. I am learning quite a bit from your informative and helpful videos. I will be applying a finish to birch. I have removed the shellac off with a stripper and some acetone to clean up any stubborn spots. My thought is to apply a dye product, most likely NGR alcohol soluble product to first darken the grain and accent the splotches. I do want to keep them in. Next, I will be using a mixture of pine tar, BLO and beeswax. I just did my pine stair treads with General’s water based dye, and with just the first coat they looked beautiful. I used a cloth to apply. I also applied two coats of McNeil’s product to avoid blotchiness, and it worked fantastically. My question is, what top coat should I use now to seal the stairs without affecting the stain. And by the way, I could not have done this job without the help of your awesome videos. So informative, just what I was looking for. Someone to explain the steps and procedures clearly. You can use any topcoat you want. Depends on what you’re comfortable applying and what looks best on the stairs. Testing on scrap or in inconspicuous areas is always advised. Definitely don’t hit the visible stuff if you aren’t absolutely sure about what you want to do. But you should be able to use oil-based or water-based finishes equally well on that surface. I’m building a walnut trestle table for my parents. I had planned on using Arm-R-Seal for the top and just BLO on the base. But the base has several parts that don’t quite match in color with the rest and also a little bit of sapwood. I now plan to use a dye to color match the entire base. My question is, how does my former BLO plan fit in with this? Can I coat BLO over a water based dye like trans tint? Should I just give up on BLO and use Arm-R-Seal on the base after sealing the dye with shellac? I had wanted to use BLO because I like the way it looks on walnut and the base doesn’t need a film protection like the top…and I also don’t feel like filling the pores on the entire base for a film finish. Hi mark thank you for the video , it was really instructive. I wanted to stain my walnut/wengè bass guitar body ( the goal i would achieve is a warwick bass style nirvana black natural oil finish) and I would know which kind of dye works best with a beeswax finish or if it is even unrequired using an oil based stain. Well any dye is going to be happiest with some sort of film finish on it, especially something like a guitar that will constantly rub against clothes and hands. So a good quality black dye followed by some coats of a satin lacquer would produce a fairly nice looking finish. You can use a natural oil, but I suspect you’ll be wearing through the dye in no time. I was curious about dying something that would fully permeate a board–so that, in theory, if you were to mill the wood after dying it, it would still remain the color you had dyed it with. I imagine this would require leaving it submerged for quite a while, letting the board dry and reacclimate. I got the idea from dying white flowers with food coloring and thought (if possible) it’d be cool to apply to wood. Is this too much of a pipe dream? Just curious. I’ve been doing some trials with small scraps and food coloring, but thought I’d ask for your two cents. Hi Marc, thanks for the info. I’m tring to dye my brier pipe and finish it. Can you help me with any recommendations. Well that’s not something I have ever done before, but wood is wood. What do you need to know exactly? HELP! I’m trying to restore 100 year old stair treads in a historic home. Stripped linoleum, glue, several layers of paint and stains. I sanded using 120 with belt, orbit, Mouse, and Dremel. I put stain, Minwax, and they blotched and look horrible! I was told they were oak treads, but am starting to think they are pine! In any case they look like crap! Have read about dyes as opposed to stains??? What do I do? I’m a quilter / fabric dyer that is getting into wood turning and I already have a huge collection of water soluble Procion MX dies. On the label it says it can be used on wood. Any opinions? On your test pieces, you have little dribbles around the corners. On a real piece of work with multiple corners and elements, that’s what happens to me if I apply dye by hand, no matter how careful I try to be. Then, when I work around that corner later (since you can’t do everything at once), I have a color difference since that spot now really has two applications of dye. I’ve been shown how to apply dye with HVLP in a way that makes this problem go away but I’d like to use dye by hand because of access to spray equipment. My question for you is, in your experience, on a real piece of furniture rather than a flat test board, is there a way to get dye on evenly without spray equipment? Imagine doing a chair, for example, or a bed side table. If so, what are the tricks? Dyes really are wonderful! I am sure there is, but I don’t do it that way. The way I became proficient with dyes if via HVLP. The problem with dyes is that they are very thin and they absorb and dry quickly. So they aren’t ideal candidates for hand application. But, I’m sure with enough practice someone can get quite good at it. For me, it’s HVLP all the way. Thanks- That seems to be what others are saying too. If I wanted to go with a compressor rather than turbine, what do you think would be the smallest usable size if I’m doing chairs, blanket chests, chests of drawers? Maybe you have this elsewhere in your blog and I should dig more :-) I’m limited for space. I have a customer that wants a carved weathervane with an antique natural wood look. Has anyone had any experience with this? Any recommended stains or colors of stains? Yes, of course it is. But on older posts, there just aren’t as many eyeballs on your question. I actually missed it myself. If your customer wants a natural wood look, why not just go with a decay resistant wood species and no finish? – The piece is already made out of pine. From watching the tutorials, I thought a combination of dark brown and amber with the General Finishing Dye Stain. I will try it on a test board and see what the results are first. I’m trying for an old worn wood effect. Do you think a glaze on top of dye would work? We noticed the stain on the site is labeled “Reducer” and wondered what that meant? Appreciate your help. Well it’s tough to say for sure since everyone has a different idea of what looks “aged” or “weathered.” I have no doubt that an assortment of dyes can get you there. Glazes might work too since they are good at depositing lots of color in the nooks and crannies, which also lends well to the aged look. Pine also has a tendency to blotch so just adding stain/dye alone will give you a sort of mottled aged look to start with. Most try to fight this when staining, but when going for something rustic you usually just let it fly. As for reducer, that just means something you can dilute a finish or dye with. Often times you don’t need a brand-specific reducer if you’re only diluting a small amount. Just have to experiment and hope for the best. Thanks for the help. I am building a project that i was originally wanting to do a stain fade from one color to another but could not find any tips on the how-to’s of doing that if it is possible, however, my research landed me on several dye options and techniques that i want to learn and try to master…my question is this: the project I am building will require wood filler and the such, assuming it is sandable, stainable filler, how will dye react with it, and will my results be fluidic with the rest of the look of the project or will i have this one sore thumb sticking out where the filler was used? I have started to use GF pigment stains due to the availability of color and mixability. After viewing this video I am going to try the dye stains as it will get deeper into the wood. I am getting into making more projects using maple and using a dark finish but am having problems with getting great coverage so I hope dye will be for me. Blotching is my issue (more so on solids than plywood). I am located in Canada and have some problems finding great products. Luckily Lee Valley carries the GF dye and pigment stain. In the past I have used Minwax water based conditioner to raise the grain and help with blotching. Do all prestain conditioners do the same thing? I have tried raising grain with water and sand it down but find that when I apply stain or conditioner and the grain raises again. Do I keep watering and sanding? Why is it still raising? I have also had issues with conditioner being to wet after the time listed on the can. I have been letting it dry completely (over night) and sanding and staining the next day. Is that ok? Just as a side note I only use water based products as they are easy to clean. I am also having great luck with Minwax polycrylic using an Earlex 5500 HVLP. 220 or 320 will work. I don’t think you’ll see much difference honestly. I am going to use general finishes dye stain, and I was thinking about layering general finishes walnut stain over the dye. Do you have to seal in between this step, and do you recommend this method. You don’t have to seal as both finishes are water-based. But, you might find that the second stain might reactivate the dye to some extent. GF dye has a binder in it so unlike other dyes, it won’t just rub off with water, though a small amount will indeed mix with the stain. Might not be enough to even notice. Is this a recommended method? Well, it’s hard to say. There’s nothing wrong with it per se. So you’ll want to test on scrap and see if what the effect is of the second stain to know if it’s worth doing. This is a great video, however, I tried to view it a second time and have been unable to do so. I have been able to view the commercial many times. Any ideas? Seems ok on my end. But we are in the process of changing all of our embeds to YouTube for increased reliability. I’ll change this one for you right now so you should have no issues viewing it. I am in the process of testing stains for a kitchen bar I am building. The bar is made from maple ply with solid maple trim, drawer fronts and doors. I have tried GF Colonial Maple Gel Stain, which is the color my wife is looking for. The problem I am having is that the wood is blotching even after I put a coat on Zinser seal coat on. I’ve tried a one pound cut and a two pound cut. Both yield blotchy results. I am starting to wonder if the light colored stain is the problem. I would also like your opinion on dying the maple instead staining to get the color I am looking for. Does maple have blotching problems with dye as well? What do products do you recommend for dying toys? Obviously we need something that is non-toxic and no color transfer (kids with wet hands or sticking the toys in their mouths. Maybe food coloring with a coat of shellac for protection. Possibly the shellac will do the trick but per the post at http://www.woodweb.com/knowled.....ealer.html it will not work. I know for sure just food coloring will not work. The transfer of the dye when it becomes wet is huge. I’ve also been trying to get information about Stockmar watercolor paints and others. Sometime in the past I had purchased colored toothpicks from Kroger food store. I followed up with Kroger corporate but they would not release any information because it was considered proprietary. I also contacted Grimms Speil & Holtz see https://www.grimms.eu/index.php/en/ and got the same answer. It would seem reasonable that whatever they are doing is the right thing to do. I don’t think the Wood Web thread negates the use of shellac. I only read the first 10-15 responses but I didn’t see anything to contradict what we’re talking about here. Both dewaxed and waxy shellac can be used over a dye to seal in the color and provide a non-toxic finish. The debate in that forum thread was with regard to topcoating the shellac finish and the effects of using waxy shellac. I used shellac over GF dye once. The shellac pulls up the color. If you spray it and are careful, that’s not a problem, but if you get a run (like I did), you’re in trouble. Trying to wipe that run to even up the running color made it even worse. I was trying to put on a light coat just as a barrier / seal coat, but blew it. I can’t imagine brushing shellac over waterbased dye given this one limited experiment. I didn’t try this over food coloring, but given that is waterbased too, I don’t see why it would be different. It’s worth a shot, but on a test piece for sure. I should have sealed with a quick oil-based coat, like Charles showed me and like I’ve done on other things. Unless applying as a sealer coat on raw wood, i nearly always apply shellac via HVLP. I should have been more specific. I gave up on the food dye I could not get past the transfer when it got wet. Note I did not attempt to seal it, my fear was that I would miss an area and have the transfer. I’m dyeing wooden blocks where the base is 1/2 x 1/2 and the length varies from 2 1/2 to 6 1/2 (or somewhere along there) and I have 100 pieces. Yesterday I went by my local Michaels Craft store and picked up some 2oz bottles of FolkArt and Americana acrylic paints. Today I went back and picked up several more bottles of different colors and some 8 oz clear plastic bottles. I then put the contents of the 2 oz paint bottle into the 8 oz bottle, and then filled the 2 oz bottle with water (abut 3/4 inch from the top, e.g. 2 oz pf paint and about 1 3/4 oz water) shook it a bunch, dumped it into the 8 oz bottle and then shook it. I ended up with 12 different colors. I purchased 14 different colors (I only used 12 colors) and 12 8 oz bottles for about $30. The 8 oz bottles are squeeze bottles with a pointed cap. I then squeezed out a small amount on one of the blocks, with rubber gloves on I used a small piece (about 2 1/2 sq) of an old T-shirt and spread the paint. At this time I’ve completed all but 6 blocks, I needed a break because it took MUCH longer than I expected. However I’m super pleased with the results. The paint is very quick to dry and I will then hit it quickly with 600 grit sand paper using my sander, this will knock off the high spots due to the water raising the grain. Then I will apply a mix roughly five parts boiled linseed oil to one part paint thinner. The linseed oil is my current plan but I may change this. About 40 years ago I used linseed oil on a gun stock and was very pleased with it. But I also like Marc’s idea of using HVLP and applying shellac, this would be MUCH faster. As I looked for something for the final coating (1) I discovered that shellac is OK (2) I did apply shellac to the tray for the blocks but I left the blocks with only the FolkArt acrylic paint. To apply the shellac I was lazy and purchased a spray can of shellac. This a really interesting topic for me and I thank you for delving into it. In your experience, are there any glycol ether solutions marketed that could be used for creating your own tint suspensions from the water based powder dyes? Not that Im aware of unfortunately. 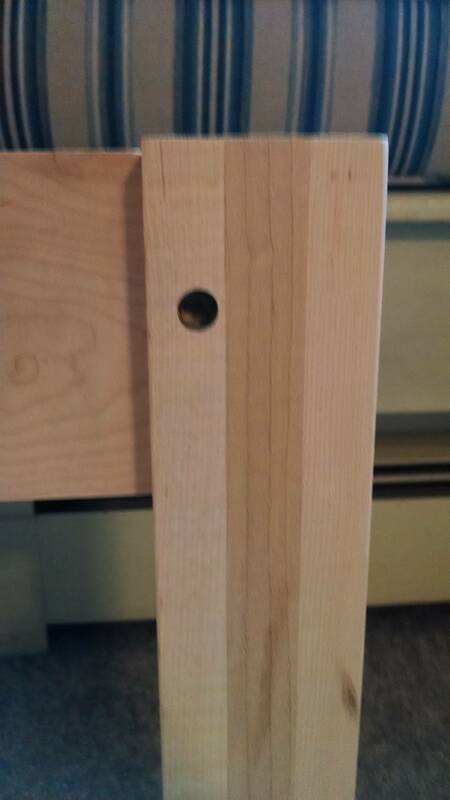 Would you recommend a dye to help “blend” the differences in long grain of a laminated table leg? I laminated 3 pieces of maple for table legs and the long grain of each laminated piece shows differently (like a racing stripe down the center). Unfortunately I did not consider using two face grains and a mitered corner until it was too late. I want the leg to show as a solid uniform piece, but im concerned once I begin to stain/finish it will only enhance the distinct pieces that make up the leg..
We are trying to replicate a table for a company that is made out of white pine, has a dark grain and a light gray stain. Although the wood is new, it looks weathered. We have tried absolutely everything to create this look. Would we be able to make the grain pop if we used a dewaxed shellac with some black transtint dye and then sanded it down? Thanks so much for you help!! Well it depends on what you mean by “pop.” In woodworking terms, you need figured wood to “pop.” And that doesn’t sound like what you have. Since you are working with pine, you’ll have to be careful about any color you add since pine tends to be blotchy. Love the show, excellent information. One question, is OK to use clear Shellac as a binder thereby just adding a topcoat. Sure is. Shellac makes a pretty nice finish! Marc, I am probably trying to get dyes to do something they won’t do but in essence I am trying to get very deep penetration into wood. I am attempting to somewhat mimic the effects of spectraply by dyeing woods different colors and then glueing up turning blanks. Any suggestions on how to get the max penetration of the dye as possible? BTW, I do enjoy your videos and watch them often. Thanks for them. Hmmm…..have you tried some sort of vacuum system? By evacuating the air you’ll force the dye further into the wood. Kind of like one of those kitchen sealer systems folks use to speed-marinate and store food long-term. I really enjoyed this video as I want to experment with using dyes on turned bowls. My only recomendation would be on your practice boards taping off a section so we could better see the changes the dyes made. Also I would have liked to see more on mixing of dye colors and the blending of different colors on one piece of wood. Thank you I really did learn a lot from your video and hope you do another one using dyes on wood turnings/on the lathe. Hi folks, I know this thread is old but it still seems like the best place to post my comment among the various blogs and discussions I’ve researched on this topic. The General Finishes WB dye stains are a great product but take some getting accustomed to if you’ve been used to using the Transtint dyes (as I had for years). The binder is really handy for keeping the color on the wood and eliminating a seal step, and it TREMENDOUSLY increases the open work time on the wood without streaking and lap marks (Marc mentioned that Darrell Peart also notes this benefit in his blog) . I just did an A/B with General Med Brown vs Transtint Med Brown cut in water. Wood scrap was pine sanded to 180, about 80 deg F in my garage shop and 70-80% RH. The Transtint, even cut in water not alcohol, was showing signs of biting in and drying up almost immediately upon hitting the surface. The General stayed workable for at least two minutes and probably longer, but at the two minute mark I wiped off the excess. No streaks or lap marks at all! Obviously a great benefit, but it does come with a slight learning curve – because of the slower bite-in time, leaving the product open on the wood surface for a pretty long time is not an option, but a requirement for getting good color saturation – especially with darker colors and/or hard to dye woods. With Transtint I am used to wiping off almost immediately to prevent lap marks, but the color bite in and saturation is still excellent. With the General product if you wipe off quickly, you get somewhat poor coverage with some colors. In my test, the Transtint depth and saturation was clearly superior to the General even after just one application – even though I left the General dye on for far longer. Furthermore, the binder in the General dyestain does the same thing a binder does in any stain – it progressively seals the wood with each application so that the next application does not exhibit 100% bite in. I’d estimate my 2nd and 3rd applications each bit in an additional 60-70%, whereas the pure Transtint is typically twice as saturated with each additional application. Having said that, seeing how saturated a color can get isn’t necessarily how a real world application would go, and for woods that naturally take dye and stain well anyway, the differences are probably even less pronounced. And if you are using the dye as an undertone or base color, the General dyes work well. I’d like to use dyed wood for inlays on wood boxes. How much finish sanding will a dyed strip of wood take before the dye wears off? How deeply does it penetrate? Is there a way to get the dye deeper into the wood? Also–will a dye work well on curly maple? Thanks! And thanks for the videos–they are a tremendous help. Hey Jim. I don’t have first-hand experience with this as I generally avoid using dyed wood for inlays. It can be unpredictable and the dye can bleed into the surrounding wood. Requires a bit of experimentation and I haven’t had the time to dig deep into it. That said, dye penetration will vary by species. But ultimately, it’s usually only “skin deep.” So if you leave the inlay proud and flush it to the surface, you may very well lose all of your color. You can let the inlay stock soak in a dye solution overnight for better penetration and I bet you can even use one of those kitch sealers to help drive the dye deeper into the wood. How well that works, I can’t say. But it’s an interesting idea. And a dye will work on curly maple quite well, assuming you want the curls to get much darker. what oil should i use if i want to use oil to dilute the powder wood dye?is there anything i should put first to power dye before i dilute it to oil?and what kind of top coat is the best for that…hope you can help me..thanks so much! Honestly, what you describe sounds like a torture treatment for walnut, lol. I never really bleached wood before so don’t have any experience there but it is certainly possible that some residual bleach was on the surface. If that’s the case, all bets are off for the dye. Neutralization sounds like a smart idea for sure. Have you considered using a different species that doesn’t require so much additional work. Basically hit it with your dyes and then topcoat? Great video Marc – I gave the General Dye/Stain a try and really like it.. Just to be clear, I can add a second coat of the dye stain to achieve a darker result, correct? I also found that if I did not “wipe it off” quick enough, that some dye absorbed unevenly (or perhaps dried) on my project (especially at the corners). I’ll need to be a bit faster at wiping the dye off, and be more careful around the corners to ensure that dye doesnt “bleed” onto an adjoining surface (and subsequenly dry) before I am ready to deal with that adjoining surface. I am dying a very large entertainment center. I worry about multiple batches of dye mixture that may not all be the same. If I mix a very large batch, can it last the few days it may take for me to complete all of the parts of the project? Yup, should be fine for quite some time. Just keep it in a sealed container and out of direct light and you should be golden. Hi Marc, great videos, they´ve helped me a lot with my projects. I have a question, I´m making a wooden bench that have a few pieces that I´m dying and I´m worried people will get stained if they sit on it. You could just get some brown pigment or dye and play around with various concentrations. Just make sure you’re using something that’s specifically oil-soluble or at least compatible with an oil-based finish. Hi! I’m trying to refinish the legs of 6 mid-century modern dining chairs. I want to use a water-soluble dye to get a darker (but transparent) oak or walnut color, and have ordered three shades of M.E. Moser’s “aniline” dye powders. What is the best topcoat to use? I’ve heard that whatever I use needs to have UV additives to protect from fading, but are there any other concerns to consider? I wonder if a water-based clear satin spray lacquer is fine? If so, what brand do you recommend, and how many coats. This is my first refinishing project, so I’m trying to be very cautious. Any advice and/or encouragement you can give me is MUCH appreciated! Do you have an hvlp system that you like or recommend. Possibly somthing in the DIY budget although I’ve tried some cheaper systems and havnt been to impressed. Looking for somthing thay can spray the dyes and do a good job on finish coats as well. My oak cabinets were stained dark brown with an oil based stain. I asked for a dark navy blue-black color. Can dye be added on top of the brown stain? Can it be mixed in with the oil based stain to change the color? Help please! 1. Is it true that water-based finishes don’t enhance chatoyance as much as oil-based finishes, but they’re less likely than oil to lead to yellowing? 2. Is CAB acryllic lacquer a bad idea for a coastal California climate with 70% humidity at ~75F degrees? If so, what top coat to you recommend for high gloss/max chatoyance? I’m planning to dye a project (storage bench) of ash wood that didn’t come out the way I wanted with stain (not dark enough, and the plywood panels lighter than the solid wood). I’ve never used dye before, and am worried about putting dye over wood that has had stain and varnish removed from it. Any advice? I assume I will get less dramatic grain since it’s effectively filled by the previous products. Thanks for all your great videos, love the sense of humor about success/failure. If, by some miracle, someone is still willing to answer questions, here are mine. I’m working on refinishing an Art Deco sideboard with a waterfall top – mostly all covered in a mystery wood veneer which I seem to be able to dent with my fingernail. (I’m sorry. I have no skills in wood identification.) Also, given the extensive work I’m putting into repairing the damaged veneer top, there will be some wood filler in the mix too. My colour goal is Black – but still being able to see the nice grain. I was thinking that Dye would be the answer – since the wood is a mystery and given my history of struggles with stain absorption. But now I’m not so sure. If I’m reading right, dye can actually Decrease the visibility of the grain (or, maybe more accurately, decrease the contrast of the grain)? 2) Will dye stain work on every kind of wood and therefore possibly be the safest/best bet to achieve a black colour? I figured I’d answer my own question in case someone stumbles upon my post wondering the same things. 4) The wood filler I used seemed to take up the dye just fine. 3) I have dyed my entire cabinet and topped with a waterbased polyurethane. I have lost ALL visible/distinct grain patterns. I may as well have just painted my cabinet with black gloss paint – for FAR less hassle and distress. Perhaps this is a function of having chosen black colour. I will never know. A heartbreaking end result after weeks of struggle. Congratulations and thanks for your video. You know it happens that I have some water and some alcohol soluble pigments (powder dyes). Do you think I could mix them, I mean take for example water yellow and blue alcohol to get green? Which solvent would you choose, alcohol? And finally could I apply a water soluble dye coat and over that an alcohol one? I know it may sound crazy but the store where I got the stuff didn’t have all the palette I wanted in a single system.